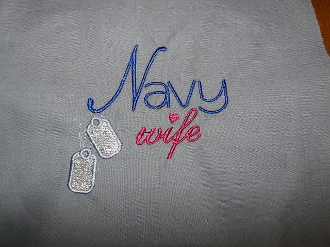 Shirts for a Navy Wife. Available in white 100% preshrunk cotton, or in some colors 90/10% cotton/poly seamless collar and double needle stitching throughout; taped shoulder to shoulder. Design is embroidered over the heart in bright colors and is approximately 4in wide and 4in tall. Several choices to choose from. Be sure and look at the embroidered design colors before choosing your shirt color. The same color design and shirt may not show up very well for example red on red or blue on blue. These shirts are co-ed sized to fit both men and women so please keep that in mind when choosing the best size for you.